Nick Cheung and Sean Lau work together again after 5 years and their chemistry remains. The film INTEGRITY (LIM JING FUNG BO YIN MOK) yesterday held a wrap banquet. Boss Albert Yeung Sau Sing, producer Huang Bin, Felix Chong Man Keung and director Alan Mak Siu Fai, actors Nick Cheung Ka Fai, Sean Lau Ching Wan, Kathy Yuen (Tong Yi), Carlos Chan Ka Lok and Deep Ng Ho Hong attended. 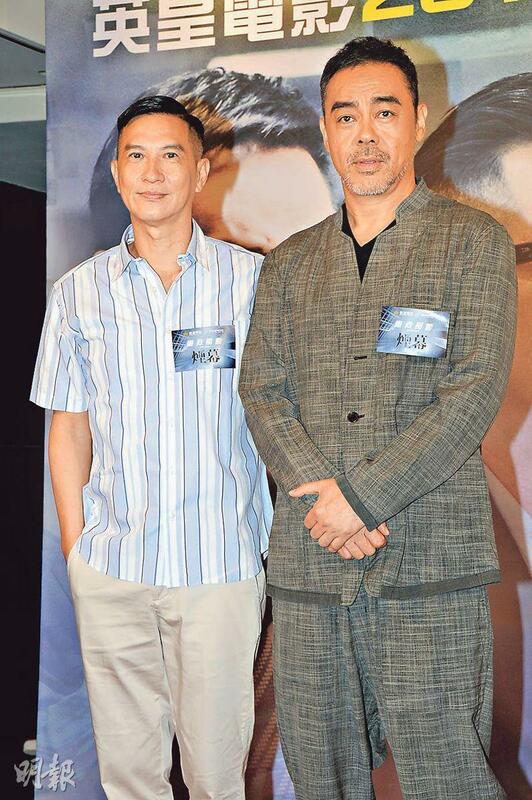 The last time Cheung Ka Fai and Chng Wan worked together was already five years ago. He said that he was the most comfortable with Ching Wan. Ching Wan joked, "Because I have to do it all!" Ka Fai answered, "Because when we work together, Ching Wan would open up and show me his heart. It's very naked!" Speaking of Ka Fai working on location for a month in Australia for "on the run" scene while Ching Wan remained in Hong Kong for the studio shoot, Ching Wan pretended to be upset and joked, "We were pinching pennies in Hong Kong, what more do you have to say!" Ka Fai also joked, "When I got back I called Ching Wan, he said that he was at work everyday to make money for me to spend." Lau Ching Wan and Karena Lam Ka Yun worked together for the first time. In the film they played ICAC investigators and a couple, while Cheung Ka Fai was the informant. However Ching Wan joked that Ka Fai actually would be more suitable to play ICAC because he had no secret. In the film Ka Fai and Ka Yun had more scenes together. Ching Wan said that he was jealous because he and Ka Yun had a few scenes of opening fire over the phone. However the director asked for a reserved method for the performance and he could not get mad. He would say something vicious and damaging, such deeply layered scenes were very suitable for him to play. In real life he and his wife Amy Kwok Oi Ming were very loving. Normally they rarely argued. Was getting into character hard for him? Ching Wan said, "This is all fake, I don't have much to say!" Ka Fai joked, "It's even more loving." In the film Chan Ka Lok played an ICAC character, Lau Ching Wan's helpful assistant. He said that he waited for this opportunity for a very long time. Because he used to watch a lot of Ching Wan's films, he was his role model. This time Ching Wan played an investigator who crossed the line, while he played a very orderly subordinate. He did a lot of idiotic behavior that irked Ching Wan very much. However Ka Lok said that at work Ching Wan was quiet, but when he wanted to learn the most was that Ching Wan never played with his phone at work. He hid in a corner and cultivated his emotions. He would also watch other actors' performance for inspiration. Thus he had to learn how elders would get into the character. Tong Yi also said that she saw Ching Wan all the time at the stairway. In one scene when she took her mark, after Ching Wan finished his lines she was so stunned that she had a bad take. Because as soon as she faced him she stuttered. However later he told herself that she could not hurt his presence, so she put even more effort into the performance. With ex Jennifer Yu Heung Yi recently suffering online bullying, Ka Lok also left messages of encouragement. Ka Lok protected his old flame and said, "Online bullying is bad, but I can't do too much and I don't have the ability to. So all I can do is only giving her a little encouragement." Ng Ho Hong's cousin who has been like a brother to him passed away from a stroke. Yesterday a wake was held. After work yesterday he went to help out at the funeral parlor. He said that now he had sudden mood swings, luckily he was able to fill his time with work. However he said that while his cousin was alive he wanted to see him work more. Each time he would tell him work came first. As for his family, Ng Ho Hong admitted that everyone was holding back their emotions. His cousin had five children, the youngest was only four. Now that his cousin was gone, he would hope to keep the children company as they grew. Fortunately his cousin has always had a plan and did some work with insurance. Thus financially he would not need to worry too much for them.